This time of year, our thoughts turn to something, ANYTHING, to make us cooler. No, no, I am not talking popped collars and wayfarer sunglasses kind of cool. Although let’s face it—those ARE still cool….I am talking boat drinks, water sports, and blasting the A/C kind of cool. The temperatures are hovering in the triple digits, and the eggs are a fryin’ on the sidewalk. And the native wildlife are restless for cool treats. And horror upon horrors, I heard the first ice cream truck of the season somewhere nearby a few evenings ago. The pied piper of Boerne, luring all the neighborhood kids out into the street, but not before a quick fly-by of mom’s wallet. Three dollars for a flippin’ Bomb Pop…..Clearly, they are insane, and I don’t think insane people should be allowed around kids. But I digress. Ice cream really is the quintessential summer treat. What healthy American person, male or female, young or old, doesn’t like ice cream? It’s cold. It’s sweet. It’s creamy. It’s fun to play with. What red-blooded American child doesn’t love to put vanilla ice cream in a bowl, top it with Hershey’s syrup, and then stir the bejeezus out of it until it looks like a chocolate milkshake? I did it. My husband did it. My kids do it. And their kids will do it after them. It’s a rite of passage. Heck, growing up in my family, just enjoying ice cream was a birth right. You see, my father is an ice cream connoisseur. A true ice cream aficionado. When I was a kid, we would take several mini-vacations each year in New Braunfels—an old German town north of San Antonio–a short 3 hour drive from our home in Corpus Christi. I thought for years that it was because we loved New Braunfels. Or that we enjoyed tubing down the Guadalupe River, shopping for antiques, and eating German food in quaint Bavarian restaurants. Nope. I’ve figured out it was none of that. It was because of the ice cream. Did you hear that? We vacationed in New Braunfels because of the ice cream. You see, at some point, my dad discovered Blue Bell ice cream. More specifically, he discovered Blue Bell Cookies And Cream ice cream. Blue Bell Creameries, established in Brenham, Texas in 1907, was at the time a small regional creamery. The north side of San Antonio was about as far south as he could find it, and about 146 miles from where we lived. You can see the dilemma, can you not? So, a few times a year we would venture north, for a “vacation” in New Braunfels. In retrospect, I now understand too why we stayed in lodging that had kitchenettes. My dad needed a freezer in which to store his stash. His contraband dairy products. He would go through a half-gallon of cookies and cream in a day. Half of it over the morning news, and half of it over the evening news. Funny how those trips became far less frequent when Blue Bell finally made it big time. That’s when it occurred to me that these family get aways had been a farce. A ruse. A ploy to get his hands on “the best ice cream in the country”. As I did then, I still enjoy watching my dad eat ice cream. He is so cute as he sits there with his big ice cream bowl, loaded up with cookies and cream. (yes, he has tried others from time to time, but Blue Bell cookies and cream is and will always be his true ice cream love). He enjoys it with great reverence, and concentration, and a deep commitment. Truly, everyone should enjoy something as much. Instead of horking down food without tasting it, try savoring it…Taste it slowly, noticing every nuance, every texture, every aroma. If we took the time to enjoy the small things, the world would be a much happier place. A few weeks ago, I posed a question on Facebook to my readers and friends…If I were to create an ice cream just for them, what might be in it? The results were fascinating, odd, and fabulous! There were more traditional flavors, such as Vanilla with Peppermint Patty, Chocolate with Orange, and Vanilla with Cookies and Cookie Dough. Then there was more adventurous Black Licorice, Chocolate and Bacon, and Mexican Cheese. Then the truly surprising such as Wasabi, Asparagus, Green Apple/Cucumber/ Lemon, and Spiced Fig/Fennel/Cognac…. So many ice creams, so little time. Inspired by my friends’ suggestions, here are few new flavors for you to enjoy. Savor them with your eyes closed, your feet up, and with reckless abandon. This recipe is different, but delicious, refreshing and bright…..If you like melon flavors, you will love it. If the cucumber scares you, just use more melon. This one is best after being allowed to mellow for 2 days in the freezer. Use a juicer to extract the juice from the apples. You’ll need ¾ cup. Beat eggs and set aside in a medium bowl. Place apple juice, melon, cucumber and mint in a food processor and puree until very smooth. Add to a medium saucepan with cream, half and half and sugar. Heat until almost simmering. Ladle a small amount of hot cream into eggs, whisking briskly. Repeat three times. Add egg mixture back into saucepan, bring to a simmer, and cook until slightly thickened, about 3 minutes. Remove from heat. Add salt and vanilla. Cover with plastic wrap, and chill overnight. Freeze in your ice cream maker according to the manufacturer’s instructions. Mix brown sugar and cayenne pepper in a shallow bowl. In a sheet pan lined with foil, place a wire rack. Place bacon in sugar mixture, coating thoroughly on one side. Place sugar side up on wire rack. Bake for 24 minutes. Remove from oven and place on paper towels to cool. Break into ½” pieces. Add pecans to bacon grease in pan. Stir to coat. Add remaining sugar and pepper mix, and stir to coat. Return to oven and bake for 15 minutes, being careful not to burn. Remove from oven and allow to cool completely. Combine last 6 ingredients in a blender and whiz for 30 seconds until mixed. A few lumps of peanut butter left are fine. In fact they are awesome. Pour into your ice cream freezer, and freeze according to manufacturer’s instructions. 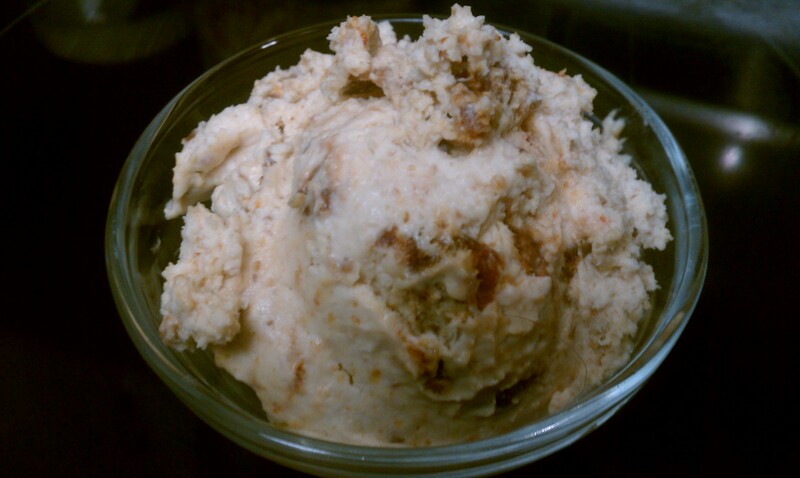 When the ice cream is done, stir in the bacon and pecans, and pour into your freezer container to cure in the freezer for 4 hours or overnight. Not too sweet, and with the slight tang of cheese, this ice cream is delightfully tropical. Combine milk, eggs, sugar and salt in a large saucepan, and beat well. Place over medium heat, and bring to 175*. Remove from heat and add cheese, beating until well melted and incorporated. Stir in vanilla. Cool. Cover with plastic wrap, and chill for several hours or overnight. Pour into ice cream freezer, and freeze according to manufacturer’s instructions. In the last few moments, add mango and/or guava. If using, and allow to mix for a minute. Pour into freezer container and allow to temper for several hours. This is one of my favorite flavor combinations, so I thought I’d put it in an ice cream. Glad I did—it is delicious. The apricot undertones of the Habanero works fabulously with the apricots, and any heat from the Habanero is immediately tempered by the ice cream. Cut apricots in half and remove the seeds (leave peel on). Cut into quarters. Add to saucepan with water, sugar, lemon juice, and Habanero. Bring to simmer over medium heat, and cook for about 5 minutes, until fruit is very soft. Process mixture in a food processor until finely pureed. Allow to cool. Stir in cream. Cover with plastic wrap and refrigerate for several hours. Pour into ice cream freezer, and freeze according to manufacturer’s instructions. 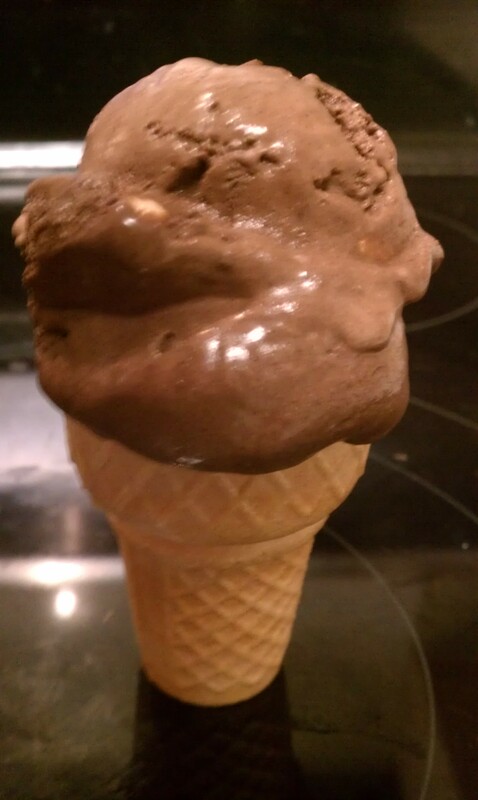 This is a fabulously dark chocolate ice cream with excellent mouthfeel. Studded with bits of orange flavored dark chocolate and toasted marcona almonds, it is a slightly more sophisticated version of some childhood favorites. Place milk, vanilla, almond extract, salt, and orange zest in a large bowl. Set aside. Whisk eggs in a small bowl and set aside. In a large saucepan, whisk the cream, cocoa, and sugar together, and heat over medium until almost simmering. Remove from heat, and whisk in the chocolate chips until melted and smooth. While whisking the eggs vigorously, slowly ladle one cup of hot chocolate mixture into the eggs. When fully incorporated, repeat two times. Then add egg mixture into the saucepan with the rest of the chocolate. Heat again until almost boiling. Pour chocolate into milk mixture, and mix well. Cover and chill for several hours or overnight. Pour into ice cream freezer and freeze according to manufacturer’s directions. When done, pour into freezer container, and fold in chopped chocolate and toasted almonds. Allow to freeze overnight or for several hours before serving. 1.) Popped collars are never cool. 2.) You didn’t make up recipes for my suggestions! Waaaah. Insert child like fit here. Though the ones you came up with sounds good. Definitely will be trying some of these recipies!! My dad lived in Houston and LOVED Blue Bell ice cream! Now, we can get it in Tennessee, and we love it, too! Thanks for the terrific recipes! Funny you mention the dodo bird…My maiden name is Gaelic for dodo bird…….Not kidding. Ooooh, good treats. Amazing flavors. Now wait a minute, I used to drive an ice cream truck for a summer in college. True, it was only 25 or 35 cents/ice cream & since it had the door on the back, I worked hard for those quarters. Kept me in good shape in & out of that truck. My best customer was a 250 lb. Newfoundland who would put his big ol’ feet on the door until his owner came out with the money for his ice cream sandwich & then the line of kids could get their ice cream. And after a long day in the sun I’d go to sleep at night hearing that da-da-da-da song in my head until I thought I’d really go nuts. Hahaha! I am sure you were a lovely ice cream truck driver…..I just think it’s highway robbery what they charge, when the kids can walk to the corner store and get the same thing for half the price. But, since we live in a rural area, the closest corner store is a mile or so, so $3.00 for a bomb pop it is! $3.00 for a bomb pop – cripes I could have paid for my entire tuition instead of just books! Oh, and there is a shave ice stand in my town that also has flavors of shave ice FOR dogs. They have chicken, beef, and salmon. So your newfie friend would have loved it! I should have moved on my idea I had from last year which was a combination people & pup ice cream truck! Now they have that exact thing in Boston & I’m bummed out. But I will say that Newfie looked like he could have eaten my entire inventory & you should have seen my face on my first day of the route when he came galloping around the corner of his house. Gentle as a lamb but don’t get in the way of his ice cream sandwich – and all the little kids knew it although they didn’t have much choice about him cutting line. I don’t like fake sugar anything, BUT….Blue Bell makes a lite vanilla ice cream that is sugar free and low fat, and it is really, REALLY good. ah now you’re just teasin me! 🙂 unfortunately I don’t get blue bell up here in Canada…..so sad! but probably better I don’t have the temptation…. I am so having ice cream tonight! Thanks for the memories. I love ice cream too, it just doesn’t like me so now I’ll have to try to make mine with coconut or almond milk. The recipes are intriguing but what are Marcona almonds or Angelcots? I live in both S. Calif and Portland, OR and have never heard of them. They are both just extra fragrant versions of their perspective cultivars. Using the regular ones will work just fine. They are more widely available now, but I don’t know just how far…. I think your father and I are kindred spirits…Blue Bell Cookies and Cream is my absolute favorite ice cream. My family does not understand why I can’t get other brands that I feel they are completely different from my beloved Blue Bell. I would love to enjoy a bowl of ice cream with your dad 🙂 He sounds like a great guy. Great recipes I can’t wait to try the melon! The Peanut butter goodness looks divine as well. I’m sorry, but your family IS wrong. haha… Blue Bell is the best. Period. Hand down. And the cookies and cream is some sort of crack ice cream…so ooooo addictive! There is just something about the sweet, creamy ice cream all jumbled up with the dark, dark chocolate of the Oreos…nothing else beats it, and nobody makes it like blue bell….now I Want some…. Best weird ice cream I’ve tried was paprika ice cream from a Hungarian festival thing. AWESOME. I’m goin to go pop my collar now. I wish there were a “love it” button instead of a “like it” button to click on. I will follow you with pleasure. Amazing recipes! I need an ice cream maker. Ice cream? 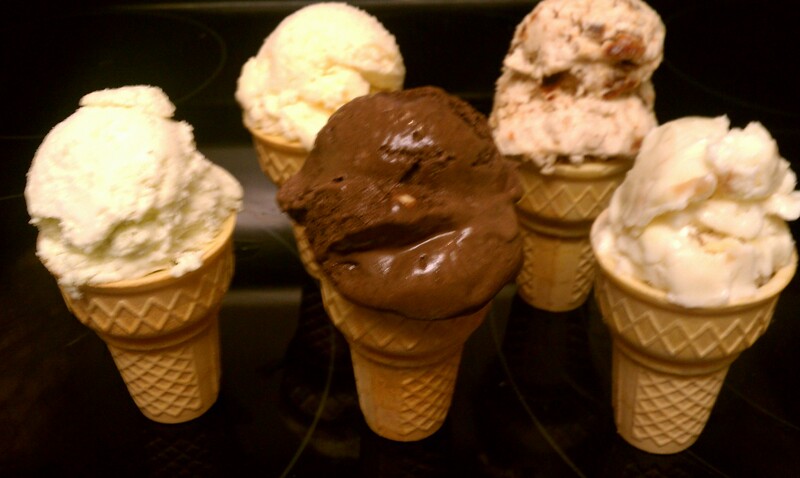 yumm,, it is my way of treating myself after work, beforfe i leave the office , i will order our best selling ice cream and indulge it before closing the week,,, nice post here,, love the recipes. My ice cream chakra is in love with all variations that contain peanut butter, so your tip that bacon and PB make a great duo will definitely inspire me this weekend. I’ll let you know how it goes. And I also come from a “cross God’s half acre for an ice cream” family. Some ice cream is just that good. Unfortunately, my hubby’s ice cream chakra forces him (against his will, of course) to consume an entire tub in one sitting. Thank God for a great metabolism! That’s as good a reason as any! I remember the jalapeno ice cream in hawaii. That was interesting. 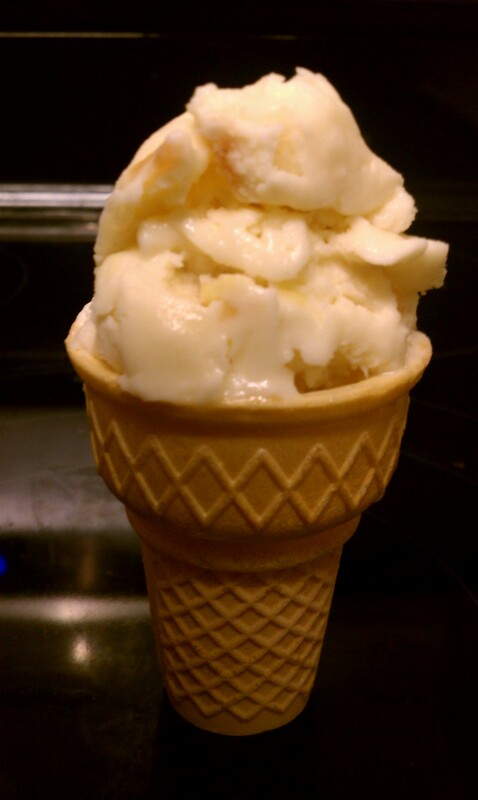 I actually had a dream about ice cream last night and it centered on your apricot habanero. Now I have to try it. It WAS, ummm, interesting…That poblano flavor was a bit weird. Habaneros on the other hand have a fruity flavor, so they go really well in the apricot ice cream..
Wow, I’m laughing and hungry after reading this! Thank for following my blog. Standing ovation to your description of your father’s delight. We should never be ” too cool” to enthusiastically and demonstrably enjoy the good things! Now I’m remembering Rush Munro’s Feijoa icecream. Feijoas are a cousin to guavas, so there’s that grittiness embedded in the smoothness. It’s only in New Zealand though, and right now I’m on the other side of the world… sigh…. Yes, there is most certainly an ice cream chakra! The orange chocolate macadamia sounds fabulous; thanks for sharing. Thanks also for stopping by my blog recently. You are so much fun to read. I love your sense of humor! There is more truth, than I realized, to the Blue Bell vs New Braunfels story. I can now admit that the real reason for those trips was the Blue Bell ice cream. I have eaten ice cream/gelato/custard all over the world and there still is none finer than Blue Bell. It is still one of two reasons why I close my eyes to savor the pure enjoyment of it all. I am GUILTY as charged. Thanks daddy, for reaffirming what we three girls have long suspected! We didn’t mind of course, as the river was still clear, and cold, and fun! What is the other reason Bobby? I am afraid to answer, but proud that you caught the innuendo. I’m planning on owning the icecream attachment for my Kitchenaid by the end of the year and can’t wait to try some of these amazing icecream recipes! Thank you for sharing! PS: Thanks for following me at Pairodox Farm. I get it. French vanilla is still my all time go to flavor. Great post and super awesome title! She is a lot like her dad. He says he is often confused with Pit, Brad not arm. Ohhh wow wow!!!!! These look divine xD can’t wait to try my hand at some of them! Peanut butter ice cream sounds gorgeous. Although being in England hot chocolate has more of an appeal than ice cream at the moment! love your post! I absolutely love ice cream and I work in new braunfels 🙂 Thanks for recently following my blog and I really hope you stay tuned and please feel free make comments/suggestions! I am definitely going to check out more of your posts and jot down a few of your yummy sounding recipes! I would definitely try that peanut butter one. Between you and Jen, you got me wanting an ice cream maker now. Think Mrs. G will notice if I go get one? But she’ll be glad you did, when you serve up a scoop of something cold and yummy! Except she doesn’t have a sweet tooth…. I don’t either, really. 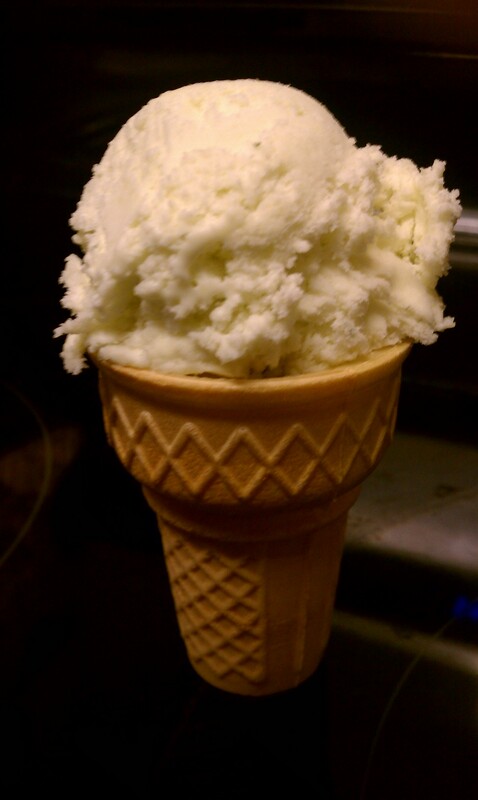 But every once in a while, nothing cures what ails you like ice cream…I crave peppermint in the winter time, strangely. Did I see a statistic somewhere that said Americans topped the charts internationally for ice-cream eating? Us and the Italians, another group of ice cream aficionados! Loved this post, and reminded me of family drives out to our ice cream shrines, most notably Kimball Farm in Westford Massachusetts. Not sure how we would NOT have caught Dad’s innuendo. Yeesh. That being said, the confirmation is nice because I had no clue at my young age that we were really going for ice cream. Here I thought it was just for family vacay. Though I must admit I always wondered WHY the NB trips stopped. There is a gelato place in the French Quarter that I swear, caters to God. It’s fabulous. I need to try some of your yummylicious ice cream. You have brought sunshine to our 38 degree Celsius weather. So, I am giving you the Sunshine Award. Congratulations! For details, visit our link: http://www.jimmyandcha.wordpress.com. Thank you so much! That’s a new one! Gotcha added to my recognition page! Your Apricot Habanero sounds marvelous….hot, sweet is fabulous. I had a Cantaloupe Habanero at a restaurant and have been trying to duplicate it forever. I may try to adapt your recipe….think it would work ?? Yes, but melon has a higher water content, so may need to increase the fat a bit to keep it from being icey. Yum to icecream. The flavours sound so interesting! My goodness you’ve got some pretty nifty recipes here! I can’t wait to try them this summer! Especially that Mexican Cheese one! 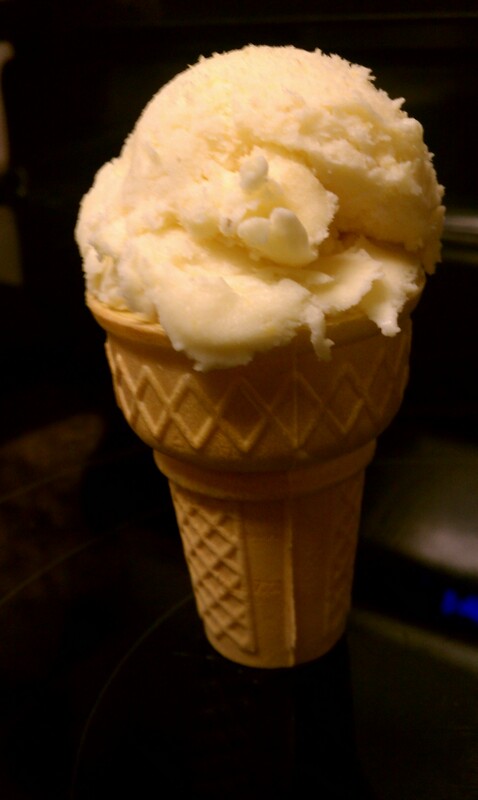 I’ve never made ice cream before! Although living in the UK we have a limited summer. Amazingly, it’s sunny right now though! The chocolate orange one sounds brilliant! The chocolate orange was my favorite. Very dark and rich, and great texture. You know what’s funny? As hot as it gets here in Texas, I only really crave ice cream when it is cold out. 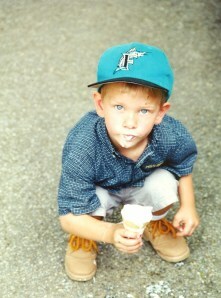 And even then, I prefer peppermint ice cream. It’s like, I want to get as cold as possible with all that cool stuff…. The first one sounds FANTASTIC!!! It wasn’t bad, but you have to really love cucumber, I think. I am only a recent liker of cucumbers, so I will forgo the cukes next time, and just use the melon and apple…. I’m intrigued by the cucumber one! The cuke ice cream was a bit odd…..but I don’t care for cukes much….with just melon it was much better! Yeah, I’m gonna need you to come up with a caramel and/or toffee flavor. And in cupcakes. Perhaps a caramel apple inside out like I read about. And a salted caramel. Stat. Ooh, gorgeous recipes! Need to try. Yippee! What a great post! Brought back some memories of wearing melted ice cream all over my face in the hot Australian summers! Chocolate, peanut butter and bacon – 3 of my favourite things in one. I have to try! Ice cream is perfect. Thanks for the reminder! Life is too short to not eat it with your whole body. What a post and what wonderful concoctions! Having a gathering on the 18th so maybe one of these just might make it to the table! Loved, Loved, Loved this post!! I believe ice cream should be the first meal of the day. The thought of enjoying ice cream with my whole body sounds delightful. I will definitely check back often. Great post. I love your blog, topic, the writing style, the pictures, everything. Thank you for sharing. I can totally relate when it comes to your dad’s appreciation for ice cream. We just got back from a family road trip to New England. I planned our entire itinerary on being able to hit the Ben and Jerry’s factory. I totally know you aren’t joking…..Ice Cream is like crack. The green apple one sounds really refreshing–great mix of flavors! “Cayenne spiced Candied Bacon” – you’re killing me! Adding bacon to anything adds to its values far as I’m concerned! I don’t eat ice cream often anymore, but guess which recipe I’m going to try this weekend? I’m putting the cayenne candied bacon in pralines next. It’s like crack. LOVE this post! Thanks for making me smile! I so sympathize with your dad! We moved to Virginia, and Charlotte NC is as far north as Blue Bell goes. My husband came back from a business trip and surprised everyone with a cooler full of Homemade Vanilla! He was the hero of the month! My Mom & I polished off a half gallon by ourselves! By the way, I spent many a summer in New Braunfels at Schlitterbaun!! OMG. I can’t wait to make the Dark Chocolate Orange. Thanks! Oh and bacon in ice cream I just can’t imagine but probably amazing! !